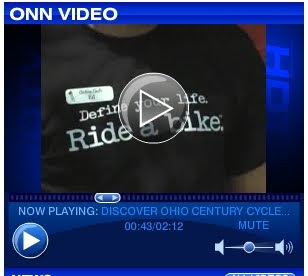 Jennifer Dugan of the Ohio News Network stopped by the Century Cycles store in Peninsula last week to do a report for their Discover Ohio travel series. She talked to Kevin and a few local visitors about the surrounding Cuyahoga Valley National Park, the Towpath Trail, our bicycle rentals, and the Bike Aboard program on the Cuyahoga Valley Scenic Railroad. Click here to read the report online and watch the video!